Thousands of farmers from across the country on Thursday reached the Ramlila ground in the national capital for a mega protest march to Parliament Street on Friday demanding higher crop prices and farm loan waiver. 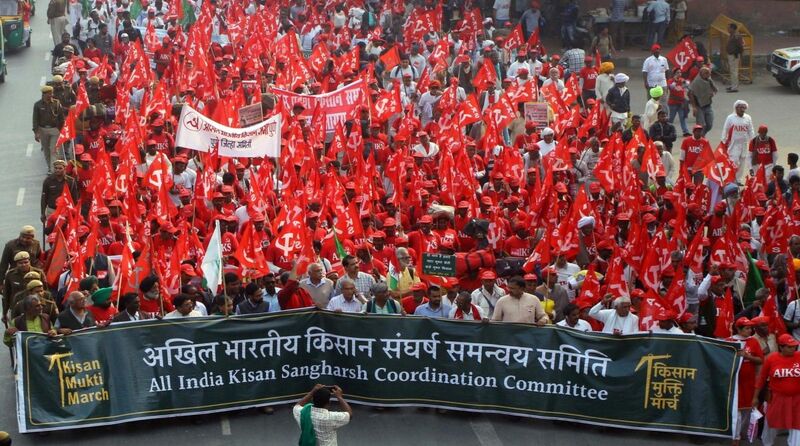 The All India Kisan Sangharsh Coordination Committee (AIKSCC), which has organised the Kisan Mukti March, has not yet been given the required permission by Delhi Police to hold the rally. Farmers, who have come to Delhi with demands like debt relief and remunerative prices for their produce, will start their march towards Parliament Street on Friday. The farmers reached the national capital carrying skulls of two of their colleagues who had committed suicide, a leader of the National South Indian River Interlinking Agriculturalists Association said. The protestors have threatened to march naked in case they are not allowed to go to parliament today. Police have made special arrangements for the protest with 3,500 personnel called in. 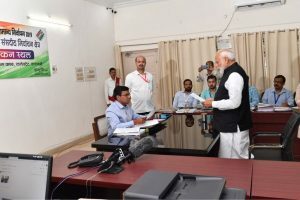 Swabhimani Shetkari Sanghatana leader and Member of Parliament from Hatkanangle in Kolhapur (Maharashtra) Raju Shetti said if permission is not granted for the rally, the working committee of the AIKSCC would decide the next course of action. Farmers, from Andhra Pradesh, Karnataka, Gujarat, Madhya Pradesh, Maharashtra, Tamil Nadu, West Bengal, Uttar Pradesh, Rajasthan and other states, will march on four different routes in the national capital, starting at three major railway stations Anand Vihar, Nizamuddin and Bijwasan and at Sabzi Mandi, their leaders said. All the marchers will pour in at Ramlila Ground in the heart of the city by evening. Kamla, a functionary of the All India Kisan Sabha’s Delhi unit, said farmers have also arrived at Majnu Ka Tila, from where they will start marching in groups to Ramlila Maidan. “We hope by 3 pm, farmers from across the country will arrive at Ramlila Ground,” said AIKS. The two-day rally will be “one of the largest congregations of farmers” in Delhi, the All India Kisan Sangharsh Coordination Committee (AIKSCC) claimed on Wednesday. The AIKSCC, which claims to be an umbrella body of 207 organisations of farmers and agricultural workers, said a cultural programme would be held at Ramlila Ground on Thursday, the first day of the protest, where prominent singers and poets from rural India would perform. Police said they have made elaborate arrangements for the rally on Friday, when the farmers will begin their march from Ramlila Ground to Parliament Street. Support for farmers have started pouring with activists taking to Twitter to ask the general public to join the march. “Women farmers greet us this morning from Brijwasan as they are all set to embark on #KisanMuktiMarch. Join us even if you are not a farmer. Join the hands that toil to feed us. Jai Kisan!,” tweeted political activist Yogendra Yadav. Lawyer Prashant Bhushan also tweeted in solidarity with farmers. “Over 3L farmers have committed suicide in India in last 15 yrs,due to successive govts betraying them. Tomorrow 1 lakh farmers from across the country are marching to Delhi to ask for fair prices& freedom from debt. Let’s stand in solidarity with them,” he said.